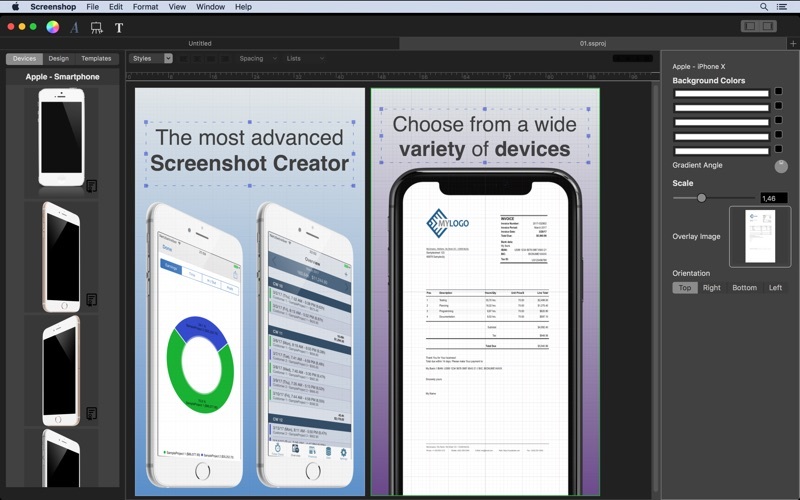 Screenshop is the most advanced screenshot creator and designer on macOS! No need to deal with expensive or complex software anymore! 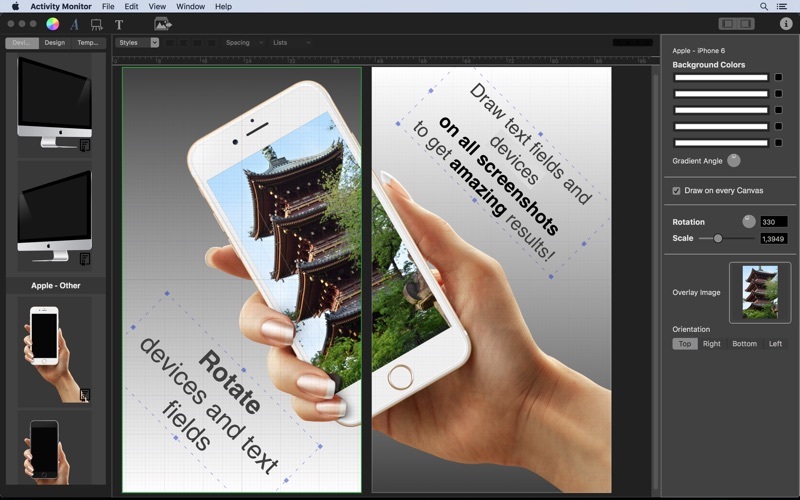 Screenshop is intuitive to use, just drag&drop everything! Your editing happens directly on the canvas. It is highly optimized, so everything happens in realtime! It comes with a lot of beautiful designs and templates, which fulfill the requirements of the iOS App Store, Mac App Store and Google Play. 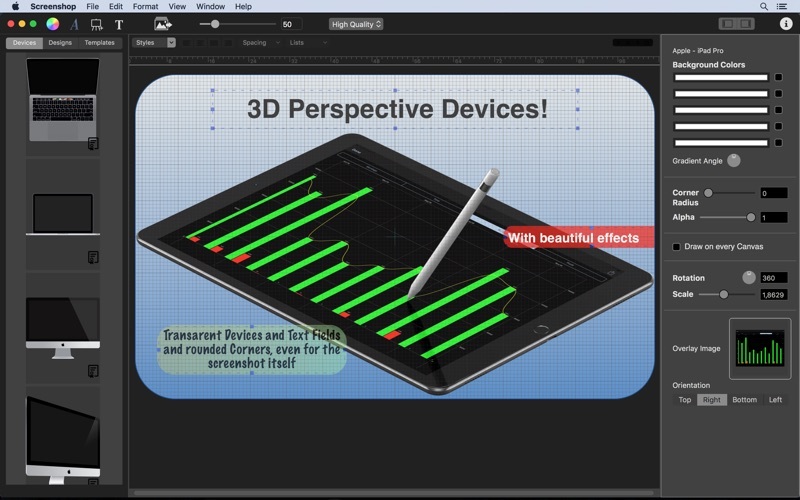 Choose from a wide range of devices, also with a 3D perspective! 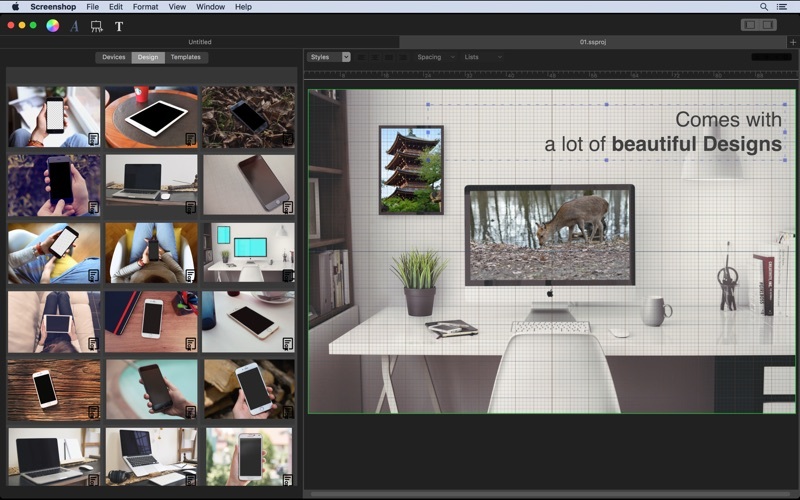 Screenshop will fit your images to match every display perfectly, even the 3D ones! Drag&Drop devices to the canvas to add them, or drag&drop them to existing devices to easily switch them. Your images will immediately appear in the new devices! 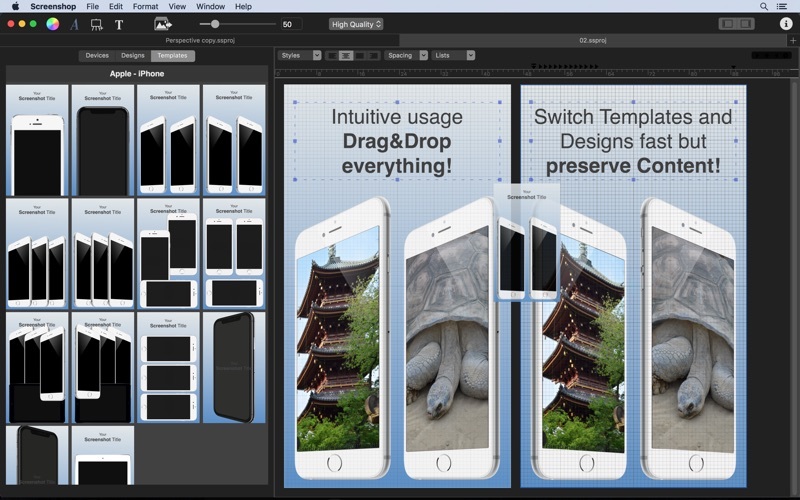 Drag&Drop Designs and Templates to the canvas to apply them. Your previously edited texts and dropped images will be reused, so you can test multiple Designs and Templates with the same content very quickly. Add fully customizable and rotateable text fields to the canvas and edit them right there. Devices and text views can be drawn over all screenshots to create amazing results. Transparent drawing is also possible! Rounded corners can be applied to devices, text views and also to the screenshots itself. Keyboard shortcuts will help you to edit devices more precisely. Command + ALT: By dragging one device to another while holding ALT, the dropped images will be switched between those devices. 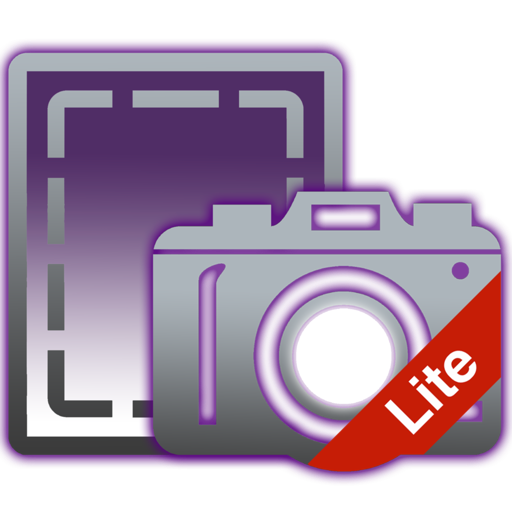 The exported screenshots will contain a watermark. Thank you very much for reporting the bug! If you like the app, please take moment to write a short review or rate it. • You can now select alpha values of background colours / gradient! • Devices and text views can now be transparent by changing their alpha values! • The screenshots, devices and text views can now have rounded corners. You can change the corner radius!